Hack for Fun. Hack for Love. On February 9-10, GDG Philippines is organizing a different kind of hackathon. 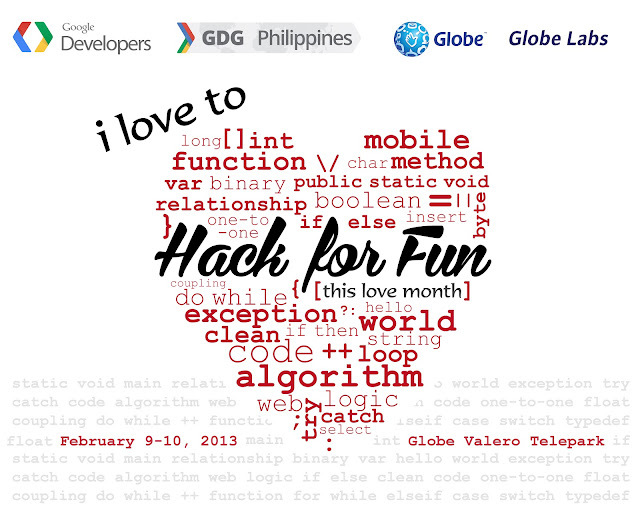 Hack for Fun is the first hackathon of GDG Philippines for the year 2013! Join us as we hack fun apps and win special prizes. All you need to do is use any Google Technology and combine it with another API or platform. Register with your friends, colleagues, or special someone. The hackathon will be from 9AM to 9PM of February 9 and 9AM-3PM on February 10 at Globe Corporat'e Showroom, Valero Telepark (111 Valero St., Salcedo Village Makati City). To signup for the event, register here. We will be sending confirmation email in the coming days. More than twenty attendees participated in the event. They produced 7 apps. The winning apps are <3 by Alron Jan F. Lam, Lordd Michael N. Lazaro and Richmond Ivann C. Liclican; Half-eaten Food by Bryan Zarzuela and Nicole Antonette del Rosario (Second), and Yatta! by Ino Gamalindo (Third). Prizes include Android plushies or teddy bear, gift certificates, Android USB and Globe Tattoo sticks. We also gave special awards.